Unity Theatre – Comfort | Hope Street, Liverpool. 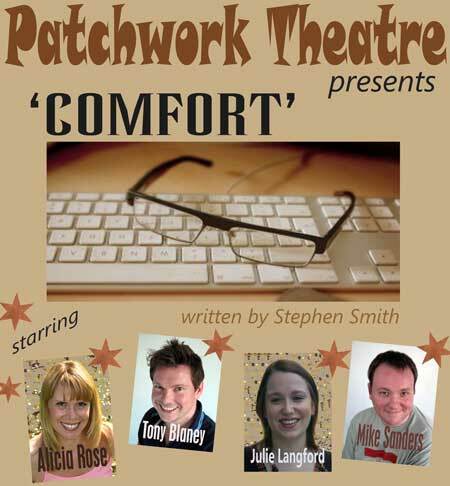 A plug for Patchwork Theatre. Redundancy has followed Rob around like a stray dog, but,as a counsellor for Personal Agony Relax and Release Call Centre [PARRCC] he begins to believe he has found his niche. With a talent for adding to company scripts Rob is noticed by the directors of [PARRCC] and he is invited to become the model for their AVATAR project. Immortality and ungenerous financial rewards beckon, however, Rob deviously breaks the company’s prime rule, “No counsellor shall evermeet a caller!” A comedy of manners for the internet age with sparkling witthat punctures the dark side of our convenience culture. Formed in 2008, Patchwork Theatre brings together poets,actors andmusicians in performance at social clubs, pubs and theatres. Patchwork performances typically stitch together Shakespeare, performance poetry, social commentary sketchesand popular music in a cabaret format. Nurturing artistes from the city’s community arts scene, Patchwork provides entertainment with a nip of satire.